The three basic types of in-ground pools are fiberglass, vinyl liner and gunite. Each one has its own distinct advantages and disadvantages, but here at Elite Pools, Spas & Hardscapes, we specialize in fiberglass for a few specific reasons. Below is a breakdown of the pros and cons of each in-ground pool type, along with general pricing information. The primary advantage of fiberglass in-ground pools is how easy they are to maintain. This is due to the non-porous gelcoat, which stands in contrast to the highly porous (and rough) surface of a concrete pool. The rough cavities in concrete pools are ideal hiding places for algae, which make weekly brushing of the entire pool a necessity. For this same reason, owners of concrete pools also have to use harsh chemicals for regular cleaning. Concrete is also alkaline-based, which means concrete pools need daily doses of muriatic acid to lower the water’s pH level. Fiberglass pools don’t affect the water pH in any way. It’s no surprise that fiberglass pool owners spend more time in their pools and less time (and money) maintaining them. It only takes about two days to install a fiberglass pool shell, compared to three to six months for a concrete pool. This is because fiberglass shells are produced off-site. If you’d rather swim this year than wait until next summer, a fiberglass pool is your best bet. Your backyard will also thank you for a less-damaging installation process. One of the major drawbacks of a vinyl liner pool is how easily the surface can be damaged. Tree branches, patio furniture blown by the wind, or even a dog’s paw can puncture a vinyl liner, which can cost as much as $5,000 to replace. There are no such worries with a fiberglass pool, because there’s no liner. You’ll never need to worry about damaging your durable fiberglass pool during daily use. 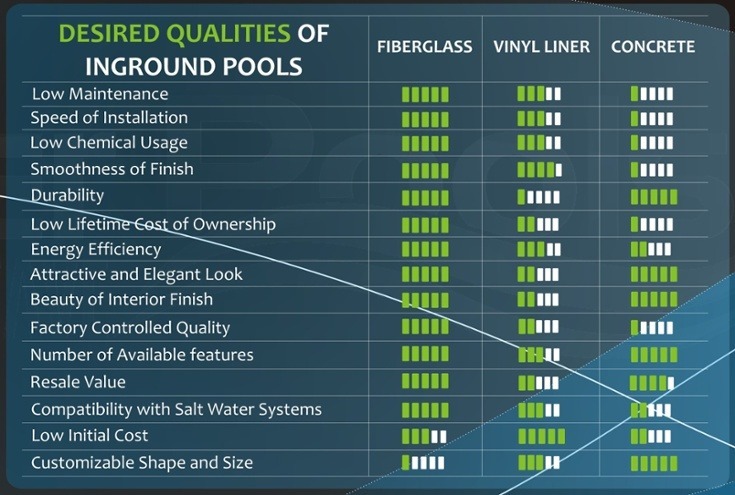 The look of fiberglass in-ground pools has changed dramatically over the past 30 years. What were once plain white bathtub-style pools have evolved into a wide variety of designs. Industry advancements such as colored finishes, elevated spas, tanning ledges, and stunning pool lights have all contributed to this style revolution. The variety of design options is one of the main reasons fiberglass pools have gained so much market share in recent years. Pool owners can achieve higher water quality by using salt chlorinators. However, they can cause damage to concrete and vinyl liner pools. Think about what de-icing salt does to sidewalks if you want an idea of how salt systems interact with concrete pools. As for vinyl liner pools, they often have metal wall panels which won’t get along with chlorinators if the liner ever leaks. Fiberglass pools are ideal for salt chlorinators. Their shells aren’t affected by salt systems at all, so owners enjoy a low-maintenance method for improving water quality. There are a couple of downsides to be considered when it comes to fiberglass in-ground pools. One is the fact that the initial cost is slightly higher than a vinyl liner pool. However, you’ll spend less in the long run due to liner replacements that are needed every five to nine years. The only major drawback to a fiberglass in-ground pool is the fact that you can’t customize its shape, depth, or overall size. This isn’t necessarily a problem for most people, because there are so many prefabricated options from which to choose. We’ve found that around 90% of customers can find a fiberglass pool that meets their specific needs. Perhaps the greatest advantage of concrete pools is that they can be made in any shape. This means they’re especially good fits for people who want extremely deep or large pools. Custom tanning ledges and other features are available in fiberglass pools, but the fact that concrete pools can be built in any shape is a definite plus. Concrete pools are, like fiberglass models, very durable. While they may not last as long as the gelcoat surfaces boasted by fiberglass pools, concrete pools can withstand impact from sharp objects much better than vinyl liner models. Because concrete is so porous, algae has many places to hide and become embedded in the pool surface. Algae is very difficult to remove once it sets in, so builders typically recommend using a steel brush across the entire pool surface once a week. Needless to say, this requires a lot of elbow grease. Concrete is alkaline-based, which means you have to add acid on a regular basis to keep the water in balance. Combined with the chemicals needed to reach algae that has embedded itself in the porous surface, this adds up to a lot of time, money, and harsh substances going into pool maintenance. Salt and concrete simply don’t mix, as we touched on earlier. Dissolved salt shortens the lifespan of the interior finish of a concrete pool. This means refinishing is a frequent occurrence, which obviously comes with a significant cost. Along with encouraging algae growth, the harsh interior surface of a concrete pool just isn’t very inviting. Kids typically have to wear water shoes if they plan to stay in a concrete pool for an extended period. They’ll end up with scraped, blistered feet if they don’t, and that’s no fun for anyone. Fiberglass and vinyl liner pools can be completed in a matter of weeks, but concrete pools may take six months or even longer to be installed. A construction project of that length is a chore for a family and torture on a yard. There’s just no getting around the fact that a concrete pool is expensive to maintain. You can expect to pay tens of thousands over the years for refinishing, chemical costs, professional acid washing, and other expenses. When it comes to initial cost, vinyl liner pools are the most affordable. They tend to cost around $10,000 less than fiberglass or concrete models. This allows families with limited budgets to enjoy the benefits of an in-ground pool. The great majority of vinyl liner pools are rectangular, but that doesn’t mean they can’t be customized in terms of shape, size, and depth. Although these custom features will cost more, they don’t push vinyl liner models above the price points of average fiberglass or concrete pools. Modern vinyl liners will last anywhere from five to nine years, with an average cost of about $4,000 to replace them. This includes the price of the liner itself, labor, water to refill the pool, and other minor expenses that might emerge. 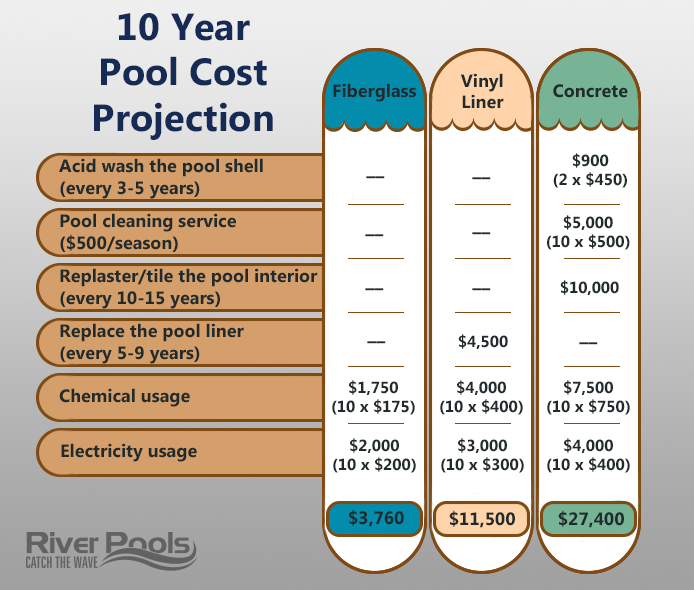 The low initial cost of a vinyl liner pool is therefore offset over time, and it will eventually cost thousands more than a fiberglass option. Liner warranties typically span about twenty years, but they tend to have some vague elements. They might only cover the seams of the liner, for example, and they may not cover labor or other related expenses that come with a replacement. Warranties are also commonly pro-rated, meaning you aren’t likely to receive much credit toward a new liner after two or three years. The surface of a vinyl liner pool is generally non-porous, but the same isn’t true for certain spots. There are some submerged areas where water doesn’t circulate, and algae takes advantage of this to grow and spawn in these places. The place where plastic steps attach to the pool wall is also ripe for algae proliferation.